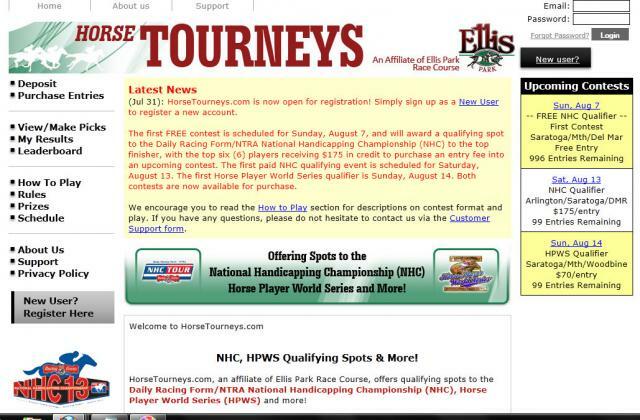 The operators of Ellis Park in Kentucky are diving headlong into the NHC Tour Championship circuit, starting this afternoon with a free online tournament for one spot in the $2 million year-end event in Las Vegas. More details are available on the Horse Tourneys website. Earlier this week, Ellis Park Race Course, Inc. announced that, for the remainder of the season, the track will be offering a whopping 50 seats to the 2012 National Handicapping Championship. As this equates to 10% of the 500-seat NHC (at what a source earlier this year told me was at a cost of about $5k-$10k per seat), Ellis Park deserves much credit in putting its footprints all over the 2012 NHC. When there is more time later this week I anticipate talking more in-depth on this topic, but for the time being the Ellis Park contest offers an attractive option, whereby contest players make an "alternate" pick for each of the 10-race card; this way, long-shot players are not necessarily defaulted to the post-time favorite - a nice feature and one that other online tournament organizers should embrace.